Posted by admin in activity reports, Bezymianny, Bulusan, Caribbean, Colombia, Ecuador, eruptions, Etna, Fuego, Gaua, Guatemala, Hawaii, Indonesia, Italy, Japan, Kamchatka, Karymsky, Kilauea, Kizimen, Machín, Manam, Pacific, Papua New Guinea, Philippines, Russia, Sakura-jima, Santa María, Shiveluch, Soufrière Hills, Stromboli, Suwanose-jima, Tengger Caldera, Tungurahua, United States, Vanuatu, Weekly Volcanic Activity Reports. The Smithsonian Institution/United States Geological Survey Weekly Volcanic Activity Report for 29 December 2010 – 4 January 2011 is now available on the Global Volcanism Program website. The following is a summary and not a substitute for the full report. New activity/unrest: Etna (Italy), Kizimen (Russia), Manam (Papua New Guinea), Stromboli (Italy). Ongoing activity: Bezymianny (Russia), Bulusan (Philippines), Fuego (Guatemala), Gaua (Vanuatu), Karymsky (Russia), Kilauea (Hawaii, USA), Machín (Colombia), Sakura-jima (Japan), Santa María (Guatemala), Shiveluch (Russia), Soufrière Hills (Montserrat), Suwanose-jima (Japan), Tengger Caldera (Indonesia), Tungurahua (Ecuador). Posted by admin in activity reports, Chile, Colima, Dukono, Ecuador, eruptions, Eyjafjöll, Fuego, Guatemala, Hawaii, Iceland, Indonesia, Japan, Kamchatka, Karymsky, Kilauea, Kliuchevskoi, Krakatau, Manam, Merapi, Pacific, Pagan, Papua New Guinea, Piton de la Fournaise, Planchón-Peteroa, Russia, Sakura-jima, Sangay, Santa María, Shiveluch, United States, Villarrica, Weekly Volcanic Activity Reports. 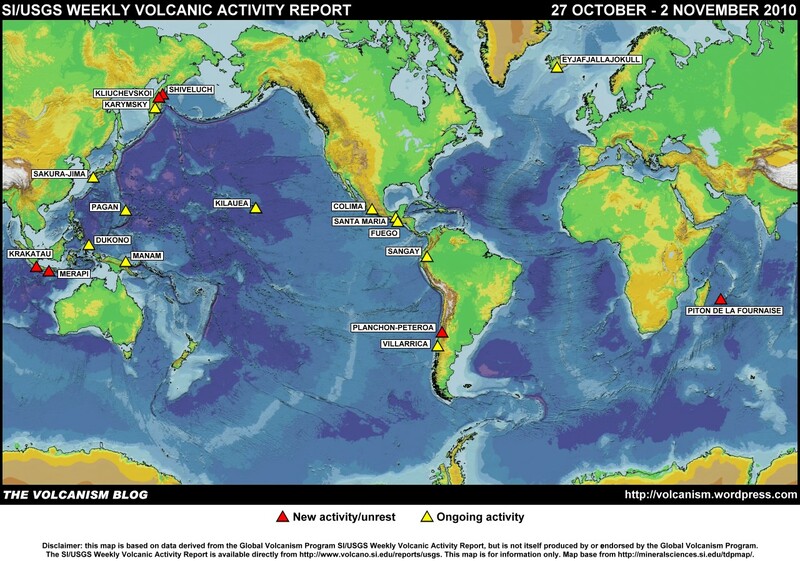 The Smithsonian Institution/United States Geological Survey Weekly Volcanic Activity Report for 27 October – 2 November 2010 is now available on the Global Volcanism Program website. The following is a summary and not a substitute for the full report. New activity/unrest: Colima (Mexico), Kliuchevskoi (Russia), Krakatau (Indonesia), Merapi (Indonesia), Piton de la Fournaise (Réunion Island), Planchón-Peteroa (Chile), Shiveluch (Russia). Ongoing activity: Dukono (Indonesia), Eyjafjallajökull (Iceland), Fuego (Guatemala), Karymsky (Russia), Kilauea (Hawaii, USA), Manam (Papua New Guinea), Pagan (Mariana Islands), Sakura-jima (Japan), Sangay (Ecuador), Santa María (Guatemala), Villarrica (Chile). Posted by admin in activity reports, Chaitén, Chile, eruptions, Fuego, Guatemala, Hawaii, Indian Ocean, Indonesia, Japan, Kamchatka, Karymsky, Kilauea, Kliuchevskoi, Manam, Merapi, Pacaya, Papua New Guinea, Piton de la Fournaise, Russia, Sakura-jima, Santa María, Shiveluch, Suwanose-jima, United States, Villarrica, Weekly Volcanic Activity Reports. The Smithsonian Institution/United States Geological Survey Weekly Volcanic Activity Report for 20-26 October 2010 is now available on the Global Volcanism Program website. The following is a summary and not a substitute for the full report. New activity/unrest: Kliuchevskoi (Russia), Merapi (Indonesia), Piton de la Fournaise (Réunion Island). Ongoing activity: Chaitén (Chile), Fuego (Guatemala), Karymsky (Russia), Kilauea (Hawaii, USA), Manam (Papua New Guinea), Pacaya (Guatemala), Sakura-jima (Japan), Santa María (Guatemala), Shiveluch (Russia), Suwanose-jima (Japan), Villarrica (Chile). Posted by admin in activity reports, Caribbean, Chile, Ecuador, eruptions, Gorely, Hawaii, Indian Ocean, Japan, Kamchatka, Karymsky, Kilauea, Kliuchevskoi, Piton de la Fournaise, Planchón-Peteroa, Russia, Sakura-jima, Sangay, Shiveluch, Soufrière Hills, Suwanose-jima, United States, Villarrica, Weekly Volcanic Activity Reports. The Smithsonian Institution/United States Geological Survey Weekly Volcanic Activity Report for 13-19 October 2010 is now available on the Global Volcanism Program website. The following is a summary and not a substitute for the full report. New activity/unrest: Piton de la Fournaise (Réunion Island). Ongoing activity: Gorely (Russia), Karymsky (Russia), Kilauea (Hawaii, USA), Kliuchevskoi (Russia), Planchón-Peteroa (Chile), Sakura-jima (Japan), Sangay (Ecuador), Shiveluch (Russia), Soufrière Hills (Montserrat), Suwanose-jima (Japan), Villarrica (Chile). Posted by admin in activity reports, Arenal, Argentina, Batu Tara, Caribbean, Chile, Costa Rica, Dukono, Ecuador, eruptions, Hawaii, Indonesia, Japan, Kamchatka, Karymsky, Kilauea, Kliuchevskoi, Piton de la Fournaise, Planchón-Peteroa, Poás, Reventador, Russia, Sakura-jima, Sangay, Shiveluch, Soufrière Hills, United States, Weekly Volcanic Activity Reports. Planchón-Peteroa: plumes rising to altitudes between 3 and 6 km a.s.l. The Smithsonian Institution/United States Geological Survey Weekly Volcanic Activity Report for 29 September – 5 October 2010 is now available on the Global Volcanism Program website. The following is a summary and not a substitute for the full report. New activity/unrest: Piton de la Fournaise (Réunion Island), Planchón-Peteroa (Chile), Reventador (Ecuador). Ongoing activity: Arenal (Costa Rica), Batu Tara (Indonesia), Dukono (Indonesia), Karymsky (Russia), Kilauea (Hawaii, USA), Kliuchevskoi (Russia), Poás (Costa Rica), Sakura-jima (Japan), Sangay (Ecuador), Shiveluch (Russia), Soufrière Hills (Montserrat). Posted by admin in activity reports, Bagana, Batu Tara, Caribbean, Chile, Colombia, Dukono, Ecuador, eruptions, Fuego, Guatemala, Hawaii, Indonesia, Japan, Kamchatka, Karymsky, Kilauea, Kliuchevskoi, Mexico, Nevado del Huila, Nevado del Ruiz, Pacaya, Papua New Guinea, Piton de la Fournaise, Planchón-Peteroa, Popocatépetl, Reventador, Russia, Sakura-jima, Sarychev Peak, Shiveluch, Soufrière Hills, Suwanose-jima, United States, Weekly Volcanic Activity Reports. 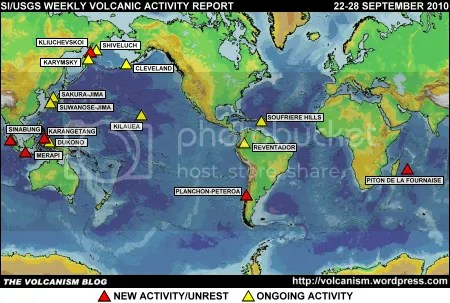 New activity/unrest: Nevado del Huila (Colombia), Nevado del Ruiz (Colombia), Piton de la Fournaise (Réunion Island), Planchón-Peteroa (Chile), Reventador (Ecuador). Ongoing activity: Bagana (Papua New Guinea), Batu Tara (Indonesia), Dukono (Indonesia), Fuego (Guatemala), Karymsky (Russia), Kilauea (Hawaii, USA), Kliuchevskoi (Russia), Pacaya (Guatemala), Popocatépetl (Mexico), Sakura-jima (Japan), Sarychev Peak (Russia), Shiveluch (Russia), Soufrière Hills (Montserrat), Suwanose-jima (Japan). Posted by admin in activity reports, Alaska, Caribbean, Chile, Cleveland, Dukono, Ecuador, eruptions, Hawaii, Indian Ocean, Indonesia, Japan, Kamchatka, Karangetang, Karymsky, Kilauea, Kliuchevskoi, Merapi, Piton de la Fournaise, Planchón-Peteroa, Reventador, Russia, Sakura-jima, Shiveluch, Sinabung, Soufrière Hills, Suwanose-jima, United States, Weekly Volcanic Activity Reports. The Smithsonian Institution/United States Geological Survey Weekly Volcanic Activity Report for 22-28 September 2010 is now available on the Global Volcanism Program website. The following is a summary and not a substitute for the full report. New activity/unrest: Karangetang [Api Siau] (Indonesia), Kliuchevskoi (Russia), Merapi (Indonesia), Piton de la Fournaise, Reunion Island | Planchón-Peteroa, Central Chile-Argentina border | Sinabung, Sumatra (Indonesia). Ongoing activity: Cleveland (Alaska, USA), Dukono (Indonesia), Karymsky (Russia), Kilauea (Hawaii, USA), Reventador (Ecuador), Sakura-jima (Japan), Shiveluch (Russia), Soufrière Hills (Montserrat), Suwanose-jima (Japan). Posted by admin in activity reports, Alaska, Batu Tara, Chile, Cleveland, Colombia, Dukono, Ecuador, eruptions, Hawaii, Indonesia, Japan, Kamchatka, Karymsky, Kilauea, Kliuchevskoi, Machín, Manam, Papua New Guinea, Planchón-Peteroa, Russia, Sakura-jima, Sangay, Shiveluch, Sinabung, Suwanose-jima, United States, Weekly Volcanic Activity Reports. The Smithsonian Institution/United States Geological Survey Weekly Volcanic Activity Report for 15-21 September 2010 is now available on the Global Volcanism Program website. The following is a summary and not a substitute for the full report. New activity/unrest: Cleveland (Alaska, USA), Kliuchevskoi (Russia), Machín (Colombia), Manam (Papua New Guinea), Planchón-Peteroa (Chile), Sinabung (Indonesia). Ongoing activity: Batu Tara (Indonesia), Dukono (Indonesia), Karymsky (Russia), Kilauea (Hawaii, USA), Sakura-jima (Japan), Sangay (Ecuador), Shiveluch (Russia), Suwanose-jima (Japan). Posted by admin in activity reports, Alaska, Arenal, Batu Tara, Caribbean, Chile, Cleveland, Colombia, Costa Rica, Dukono, Ecuador, Ekarma, eruptions, Guatemala, Hawaii, Indonesia, Japan, Kamchatka, Karymsky, Kilauea, Kliuchevskoi, Nevado del Huila, Planchón-Peteroa, Reventador, Russia, Sakura-jima, Sangay, Santa María, Shiveluch, Sinabung, Soufrière Hills, Suwanose-jima, United States, Weekly Volcanic Activity Reports. The Smithsonian Institution/United States Geological Survey Weekly Volcanic Activity Report for 8-14 September 2010 is now available on the Global Volcanism Program website. The following is a summary and not a substitute for the full report. New activity/unrest: Cleveland (Alaska, USA), Ekarma (Russia), Kliuchevskoi (Russia), Nevado del Huila (Colombia), Planchón-Peteroa (Chile), Santa María (Guatemala), Sinabung (Indonesia). Ongoing activity: Arenal (Costa Rica), Batu Tara (Indonesia), Dukono (Indonesia), Karymsky (Russia), Kilauea (Hawaii USA), Reventador (Ecuador), Sakura-jima (Japan), Sangay (Ecuador), Shiveluch (Russia), Soufrière Hills (Montserrat), Suwanose-jima (Japan).